HomeNew CarsFord CarsFord Figo 2015-2019Ford Figo 2015-2019 FAQsTell me about Ford Figo 2015-2019 interiors? 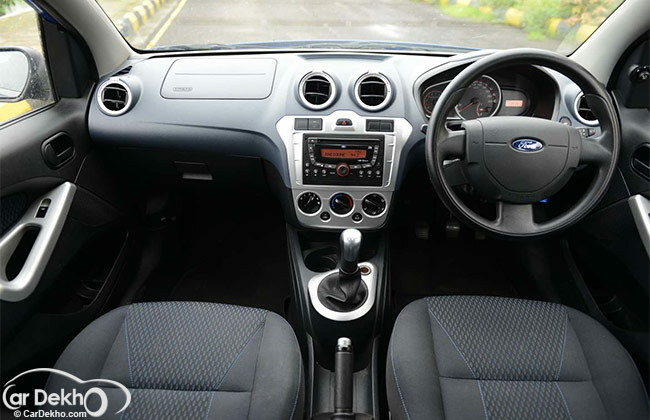 Tell me about Ford Figo 2015-2019 interiors? Ford Figo has spacious cabin that is decorated with dual tone color scheme.Door panels, dashboard, seats and center fascia has kinetic blue inserts. It has a boot space of 284 litres which can be increased by folding the rear seat which is good enough for a large luggage. The seats are covered with fabric upholstery and have integrated with better adjustable headrest comfort. This hatchback is pretty and It provides ample legroom and shoulder room to all five passengers. The Dashboard is integrated with circular AC vents in the center and similar on either side, gearbox console and infotainment system. The interior is bestowed with an advanced air conditioning unit with heater that keeps the entire cabin pleasant. This stylish hatchback provides better driving experience as it driver gets good command on road. How is the performance of Ford Figo 2015-2019?